A joint’s normal range of motion is defined by the connective tissue that binds it. The muscles, tendons and fascia that cross a joint dictate approximately 80% of its stability with less than 20% entrusted to the ligaments. Ideal body balance requires some muscles to act as stabilizers and others to act as mobilizers, depending on joint position and movement required for the particular task. A perfect balance of mobilizers and stabilizers results in optimal alignment, or joint centration. Think of joint centration like the wheel on a car. If the center of rotation is aligned with the center of the hub, it will deliver the most efficient performance. Conversely, when this neutral position becomes misaligned, the wheel spins incorrectly and can result in future mechanical problems. 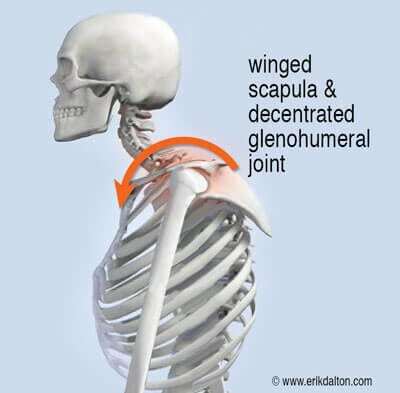 We commonly see this in upper crossed syndrome (UCS) postures where slumped shoulders and a head-forward carriage lead to scapular winging and decentration of the glenohumeral joint (GHJ) (Img. 1). Although researchers have not confirmed rotator cuff impingement due to postural issues, I definitely feel it plays a major role in those who perform overhead activities. Try this experiment: Stand in a military posture with shoulders back and chin tucked. Close your eyes and abduct your arms out to the side and over your head as far as comfortable. Notice the range of motion during this maneuver. Next slump into a forward head posture, chin jutting out and arms internally rotated. Close your eyes and raise your arms overhead as far as comfortably possible. You should have 50% less range of motion through the shoulder girdle and most feel strain in the rotator cuff at about 90 degrees. 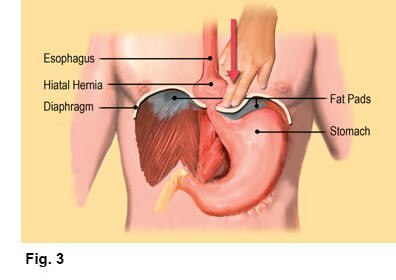 I’m not talking about pain here, I’m talking about loss of function. A key function of the cuff muscles is to maintain the head of the humerus centrated within the glenoid cavity (concavity compression), and at the same time, impose an inferiorly directed force to the humeral head. In those with rounded shoulder postures, the glenoid fossa’s mechanical axis of rotation is altered, causing the brain to activate muscles that are typically at rest, such as upper trapezius, levator scapula, pectoralis minor and deltoids. 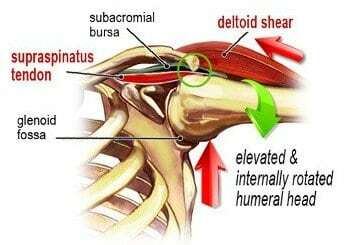 Postural overdevelopment of these muscles undermines rotator cuff stability, causing a ‘deltoid shear’ that elevates and crams the humeral head into the top part of the glenoid fossa (Img. 2). As the person abducts the arm to 90°, the supraspinatus tendon abuts the acromion, causing micro-fraying, fibrosis, and possible tendinosis. Of course, both men are right. Ground up core stability is paramount for optimal joint centration and shoulder function. The saying, “You can’t shoot a cannon from a canoe,” sums up the importance of spinal stability in all upper (and lower) extremity movements. As stated in my Massage & Bodywork column “Finding the Weak Key Link,” the thoracic spine and ribs must be mobile and the scapular muscles stable. In today’s desk-occupied, sedentary lifestyle, function is often reversed as the t-spine stiffens and the scapulae flare, leaving an unstable anchor for the GHJ. The decentrated joint predisposes the rotator cuff to injury, particularly in those who participate in activities requiring the use of overhead arm positions such as painters, tennis players and gym-junkies. Img. 3, Img. 4 and Img. 5, are examples of techniques I’ve found helpful in addressing upper-crossed syndromes, deltoid shears, and rotator cuff injuries. 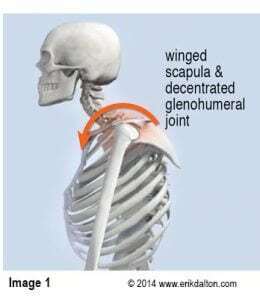 Once proper glenohumeral mobility is restored, home retraining advice should include exercises for core stability, scapular stabilization, and rotator cuff strengthening. Remember: mobility first. Refrain from advising muscle-strengthening exercises for joints that are not moving freely. This can lead to cartilage degradation and ultimately capsulitis or osteoarthritis. When massage and movement therapists successfully restore length-strength myoskeletal balance, tissue lubrication improves and the transmission of nerve impulses becomes more efficient. Better proprioceptive neural feedback enhances motor control and reduces injury in clients with the “wobbly wheel” syndrome.